Donkeylicious: Will Intellectual Property Protections Kill Millions? Will Intellectual Property Protections Kill Millions? That appears to depend on which way the Indian Supreme Court rules. 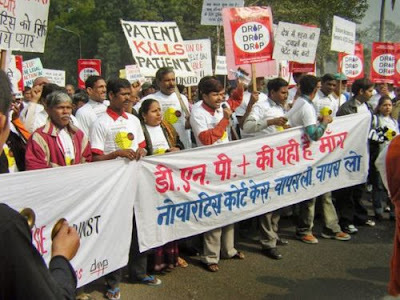 Novartis has taken the Indian government to court about the generic production of a drug that has efficacy against AIDS and cancer. It appears that they tweaked an old drug so that 30% more of it would get into the bloodstream, and want their old patent evergreened. The Indian patent office ruled that the new version didn't have enough increased efficacy, and refused to evergreen the old patent. So Novartis sued. This is a pretty tremendous issue for people with AIDS in the Third World. The generic version of the drug costs $170 per month, while Novartis' branded version costs about $2500 per month. Indian generic manufacturers are the primary source of the drugs for many poor countries. As far as I can tell, there's no need for-profit pharmaceutical companies. A lot of what they do starts from publicly available basic research done by academics and government scientists. They then carry the ball across the goal line and get patents that allow them to make tremendous money. Instead, we could turn research and development over to academic researchers funded by government grants, and set up a Fed-like body of scientists that would pick the best projects and farm clinical trials out to contract labs. The creative work can be done by smart people seeking glory and tenure, and the grunt work can be contracted out. The resulting knowledge would be open to all, and generic manufacturers could crank out cheap pills for everyone in the world. "As far as I can tell, there's no need for-profit pharmaceutical companies. A lot of what they do starts from publicly available basic research done by academics and government scientists. They then carry the ball across the goal line and get patents that allow them to make tremendous money." JR, I agree that currently structured academic labs couldn't do this. As you suggest, I'm talking about building up a complete new alternative infrastructure that would cost at least tens of billions. And I'll concede on the political unworkability of building up the alternative infrastructure. But that's not really a problem for a debate of this sort, as the political side of generating the IP changes I'm talking about here is itself in magic wand territory. "If you can make pharmaceutical patents cease to exist, you can set up these gigantic academic / govt labs" is true at least as a material conditional, and probably as a counterfactual conditional, because the world where you could do the former part is weird and awesome enough. But given all that, I don't see that you've got any argument against the proposal. If the low hanging fruit has been picked (as I agree it has) that's at least as much a problem for the current system as for a hypothetical future system. You're describing really deep problems for the system as it stands, and I don't know why the alternative system I've suggested would do any worse with them. My problem was not so much with the proposal that government labs replace private for-profit pharmaceutical companies, but rather with the assertion that all that they do is "carry the ball across the goal line." I am no fan of the pharmaceutical industry, but they do make enormous intellectual contributions to the drugs they produce. Yes, I do admit that I am deeply pessimistic about the prospects for the current system as well. I guess the difference in opinion comes about by the fact that I don't believe that simply eliminating pharma patents would bestow academic labs the ability to replace their R&D efforts. Fair enough, that sentence really does overstate things.